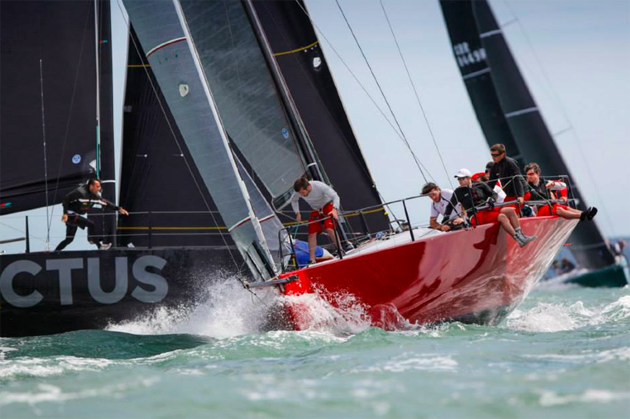 After the opening day’s wild west show, the serene Eastern and Central Solent was chosen as the combat zone for the second day of the RORC IRC National Championship. Blessed with sparkling conditions and a gentle southerly breeze, racing got away on schedule in a light southwesterly breeze. However, all that glitters isn’t gold and during the course of the day the light shifty breeze oscillated a full 50 degrees, which combined with a spring tide to provide a complex and ever changing conundrum for the competitors. Although one race start was abandoned, all three scheduled races were completed for all classes. Mike Bartholmew’s GP42, Tokoloshe II scored the lowest combined score in IRC One today, posting a 3-1-4 to make up ground on the class leader. Piet Vroon’s Ker 51, Tonnerre 4 won the first race of the day and placed second in Race 5, but the fickle breeze in the last race transpired against the Dutch yacht, which scored their discarded 11th for Race 6. Tonnerre 4 still lead the class by three points from Tokoloshe II, Sir Keith Mills at the helm of Ker 40+, Invictus is third.